We have had mornings of nippy fingers and today its a cold, damp rain. We need it though as things were getting very dry. I can’t believe it’s already September. This garden has been neglected this year and I am weeding and remaking the garden paths, tying up the apple trees and trimming them. I am hoping to plant some beets soon. 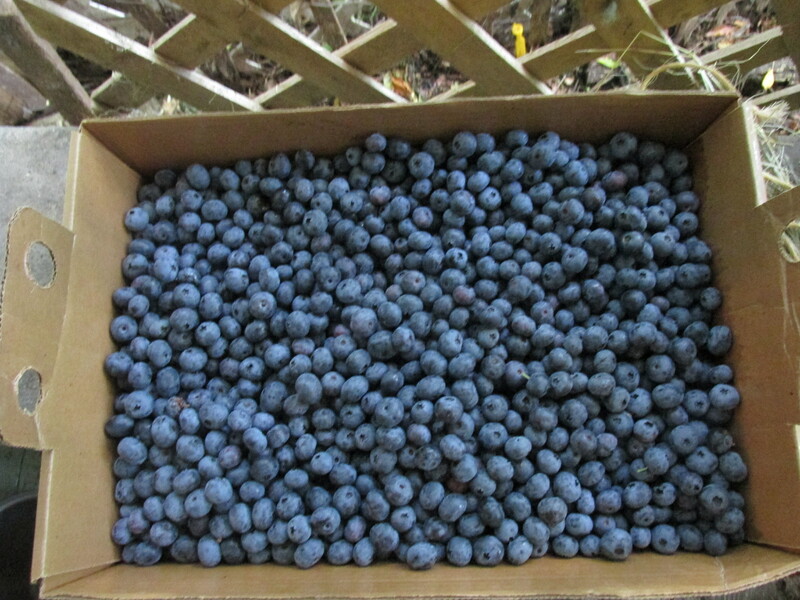 The blueberry bushes produced more berries than I ever got. I am cutting the spearmint and tying it into bundles and drying it up in the barn to freshen up the chickens nest boxes during the winter. I have other,mint plants in the front yard to do the same with. After they are all dry I will mix them with lavender and a few other herbs and store them, keeping a few branches to hang in the coop It does help to keep the coop smelling better during the long winter days. Every year at this time I think about a nice greenhouse for the chickens to go in during the long winter. More space to run around and some fresh air. I always get so busy in the fall and it doesn’t get done. I bought a make your own greenhouse book at the Library Book sale at the Heath Fair and I am planning on seeing what I can do. Nothing elaborate and something I can put up and take down every year. 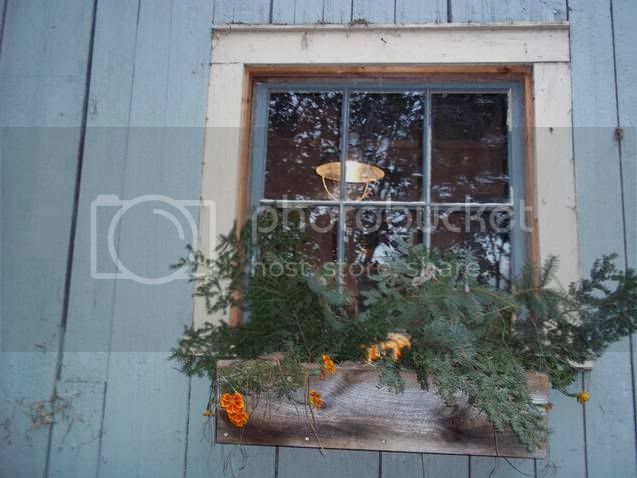 I would like to find some old windows. It takes time and I never seem to have enough of it in the fall. Our community lost a friend, mentor and Volunteer Fireman Harry Dunning. His wife Jane took loving care of him through the long illness. The service for him was beautiful and inspiring. In sadness there is beauty and it surely was in that Church on Saturday. I will be vending at the fair this year again. One thing that I have done is take an old ,broken down wooden tool carrier and fixed it as best as I could and pickle painted it. It will be perfect for my bags of wool for needle felting . I look forward to the show, good company and lots of excitement and return customers makes it a fun weekend. Pan to have lots of new handmade items there. Today hops and catnip are being dried in the dehydrator the smell permeates the house. Catnip did well where I placed it this year, plenty of sun is what it needed. I bought some Pennyroyal from Sue Bates also and it is living near the catnip and it loves it there. Its next on my list to dry. Susan has the best plants and always brings them to The Massachusetts Sheep and Wool show. She is at Brimfield this week, check out her booth at Quaker Acres. I picked a pail full of hops this week and they will be going into dream pillows today. The small Hazel Nut tree produced a box full of nuts. They are safely in the car for drying, which was the suggestion on the internet. I think I got them just in time as some of them were ripe. I am now getting Roma tomatoes and today will get them in the freezer. Peppers are on the agenda too and so far I have one large bag in the freezer. I need about 6 large bags to get me through the winter. 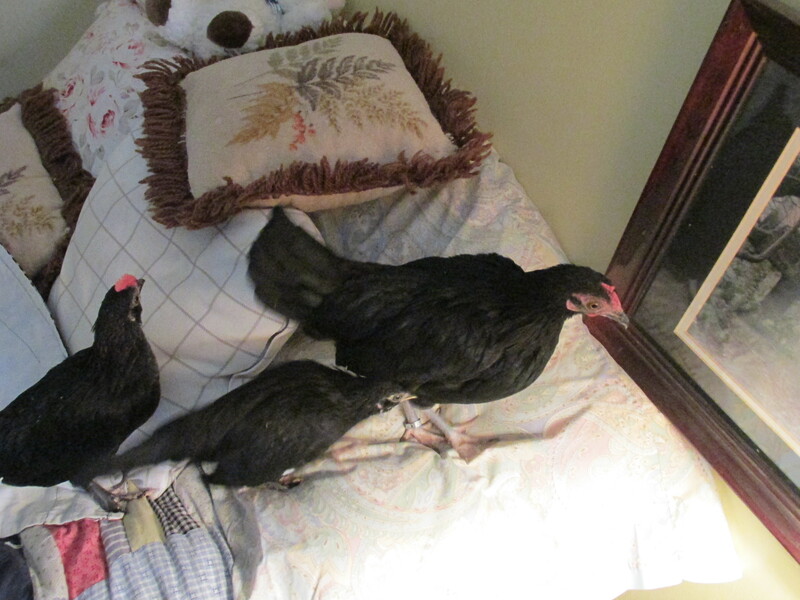 Morticia and her daughter Violet have been nesting for months now. I have separated the side yard chicken area and they along with Opal who had the sneezes when I got her, will go outside in the converted dog house tonight. They all need to change their life styles!!!!!! !In another month they will all come in and I hope to have the big front coop separated so the Bantams have their own space. 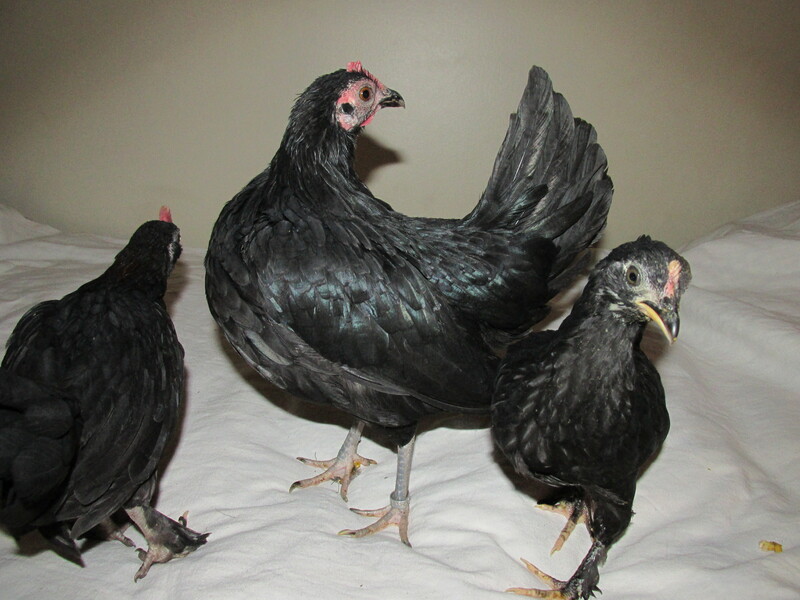 Eventually I hope to have all Bantams as they need less room and require less work.. The howling winds are blowing snow into mini twisters this morning. Snow is piled almost up to the porch floor and I am running out of places to put it.. More expected on Wednesday. I used 1/2 of a cord of wood in less than a month just to keep the kitchen pipes from freezing. I liked last winter so much more. Although I must say the chickens were out a lot this winter but of course since the snow is now up to their doorway they are in to stay till spring. The sheep are in today too as the winds from the mountain will fill the barn with snow. Hot and humid weather is making another brief appearance. it will be gone by the weekend though. we may have some much-needed rain tomorrow. Edna is a New Hampshire Red. I have never had one of these types before. She is shy and sticks with her friend Margaret. Both are slowly adjusting to the rest of the flock. 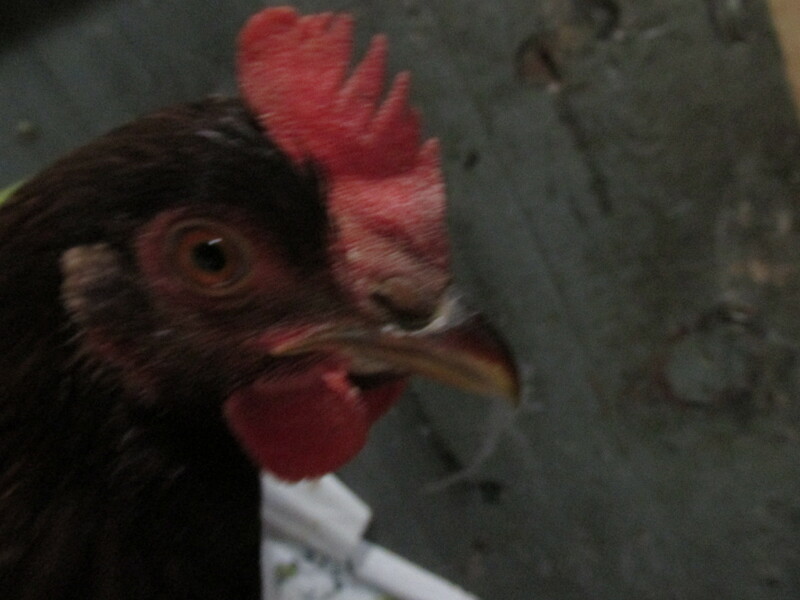 She was an escape artist in the beginning having lived on a farm that allowed her to free range. Unfortunately with all the flying predators here that is impossible. She is making the adjustment very well. Some hops and hot peppers are in the dehydrator this morning and this afternoon lots of spearmint will be going in. The dehydrator will be going non stop for days from now on. The spearmint will use in teas and for a special blend of herbs for the chickens nesting boxes throughout the winter. 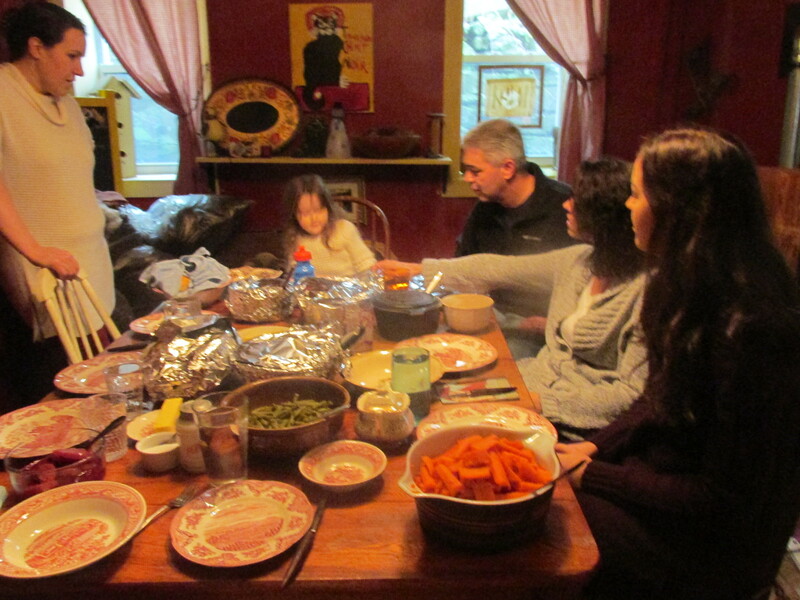 The hot peppers are the hottest, brought on tears and a coughing and a sneezing spell. It will make a great arthritis Salve. The hops will go into Dream Pillows and some will be packaged up for people to make their own. Elderberry syrup was made last week in anticipation of the long cold winter we are suppose to have. 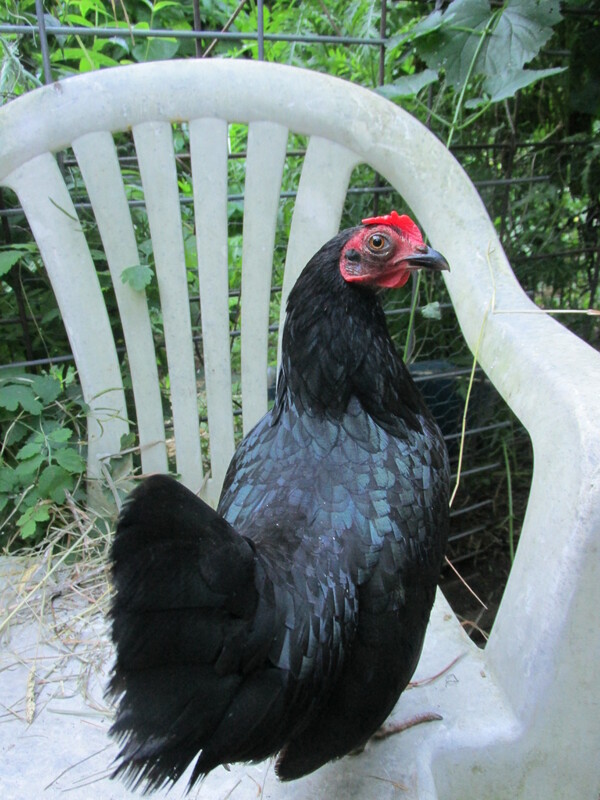 Morticia is now broody. 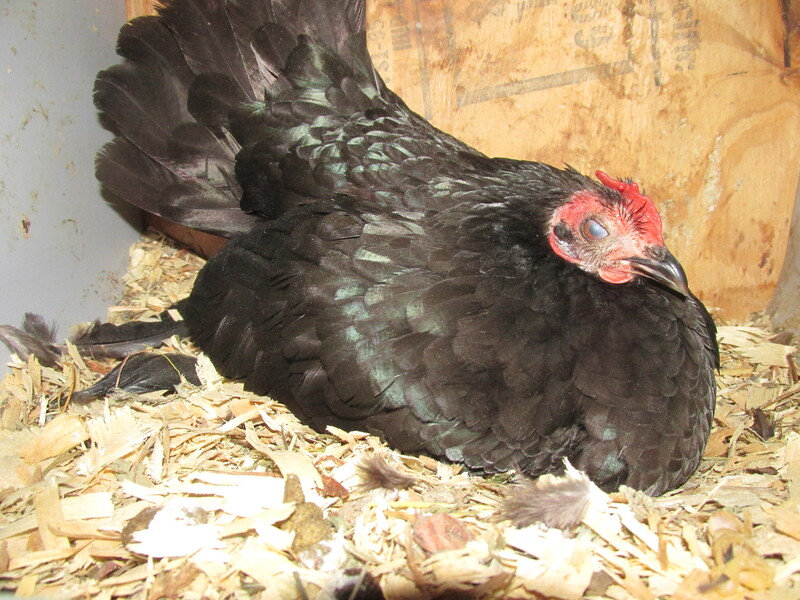 Her daughter, Violet spent 3 months int he nest box trying to hatch some eggs. Now her mother is in there doing the same thing. Those Banty hens are the greatest little Mothers. My ratio of hens to roosters isn’t good so no eggs will be hatched. I hope everyone had a wonderful Christmas. I have been either doing shows or getting ready to do shows so I wasn’t quite prepared for Christmas this year. Presents and cards were late and some cards not at all because my printer stopped working. Well there is next year to plan better. 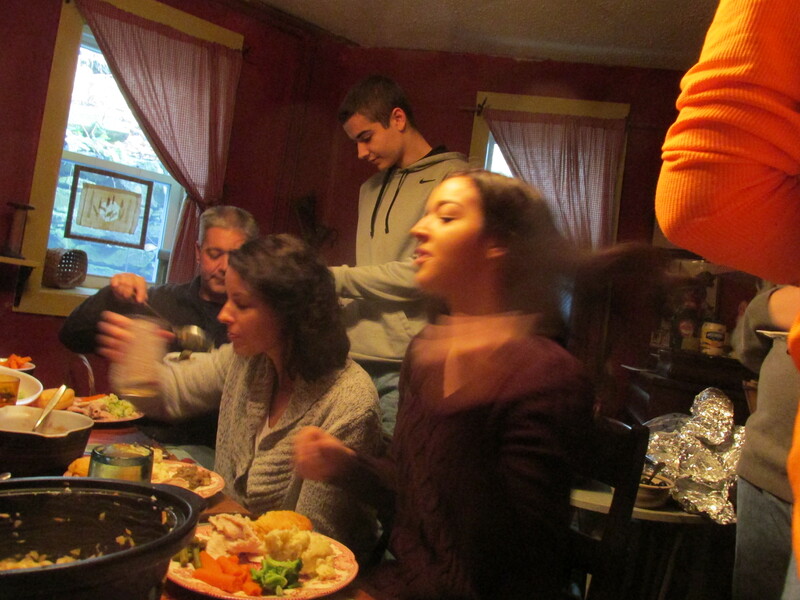 There were 8 of us around the large table and 6 at the teenage tale. A full house. Last night was cooler than it has been so Morticia had to keep her feet warm. Her son Eddie is next to her. 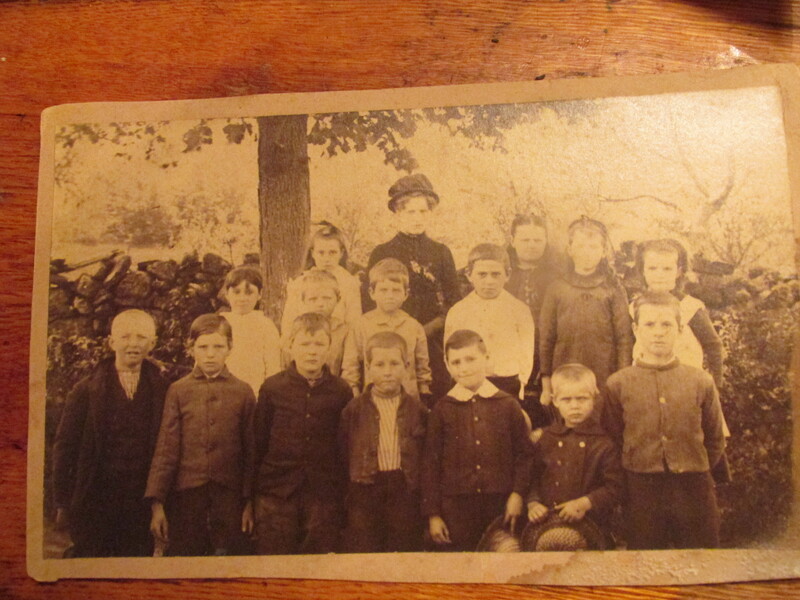 The first child on the bottom row left is my Grandfather. 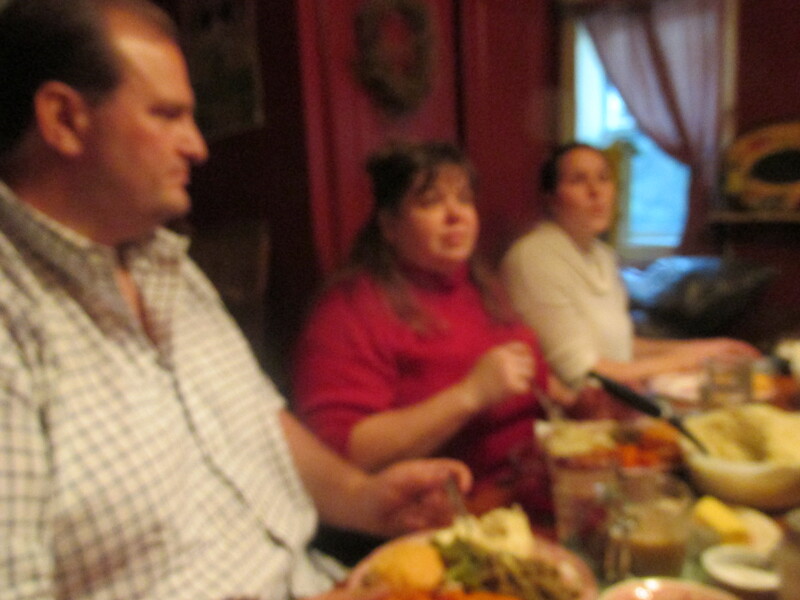 The picture as taken in Chesterfield, Mass. The picture was probably taken in the late 1800’s I presume as he was born in 1885. Chris and Lilly Pad are here for the week. We are planning to get a few small trees cut up and some of the big tree cut up tomorrow. The humidity has gone away . It’s a beautiful summer day. 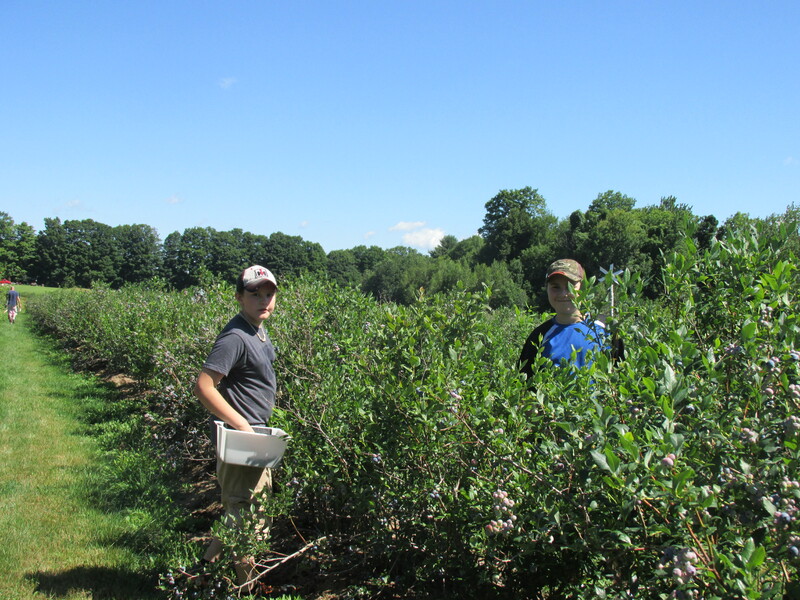 Friday was a delightful summer day with the humidity gone and bright blue skies we headed to Chesterfield to pick blueberries on my cousin’s farm. Roberts Family Farm. The berries are organic, sweet and plump. I picked over 7 pounds and Davids family picked over 11 pounds. 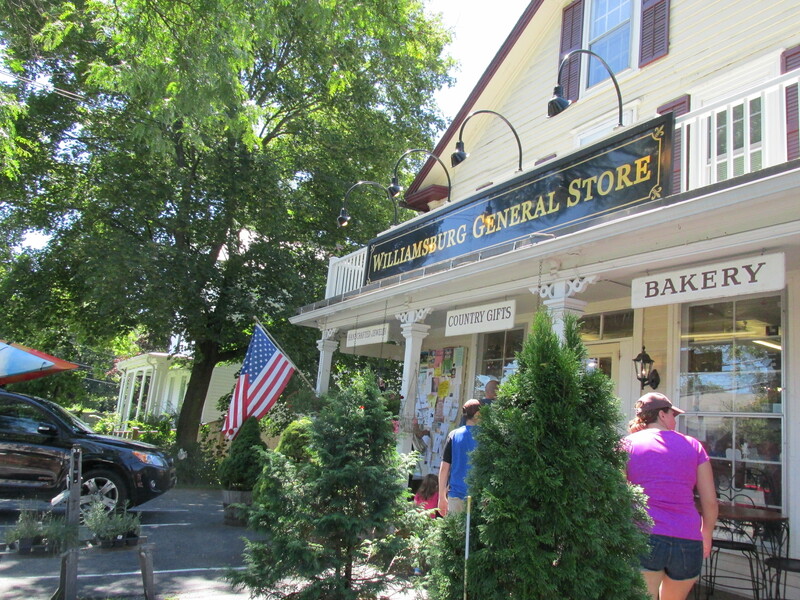 We rode down the back roads of Chesterfield and ended up at the Williamsburg General Store. A place where my Dad and Uncle took my children when they were small. The penny candy and old-fashioned toys and home-made pastries were always their favorites. And of course an ice cream cone to top off the day. 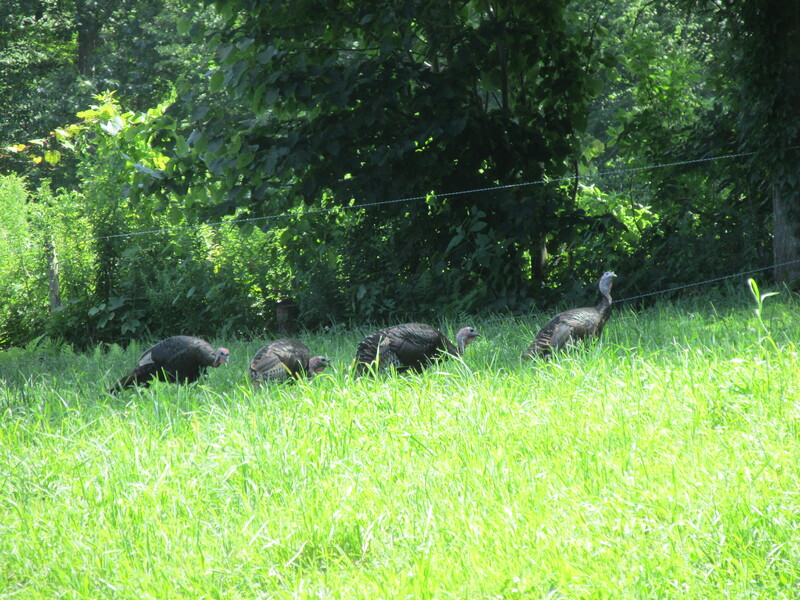 From the store back roads home where a turkey vulture flew very close to the car and we saw a group of turkeys. 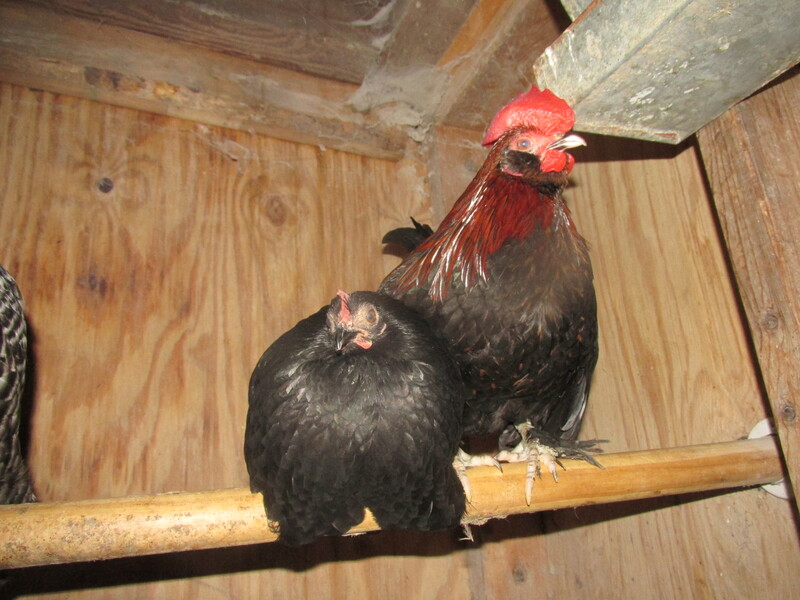 It’s always interesting to add a new hens to the flock. I have done it many ways and you never can tell how its going to work out. 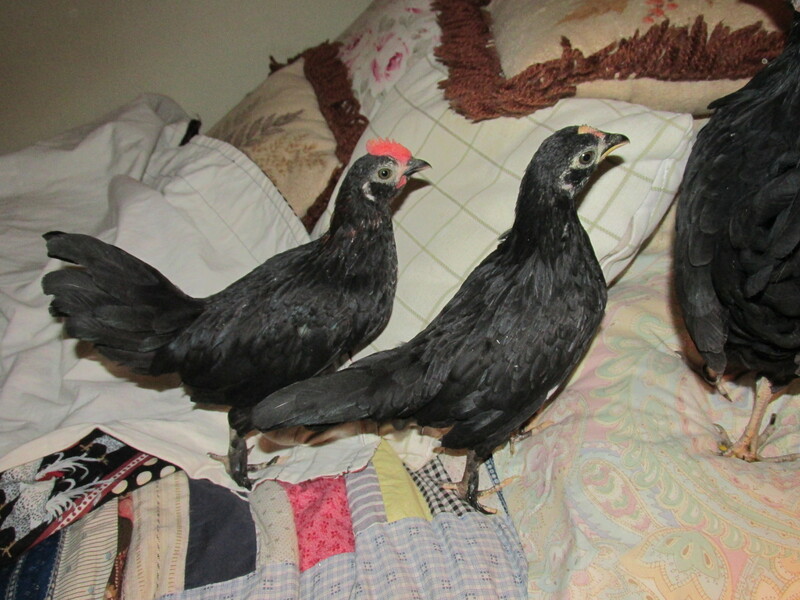 Morticia has been sneaking in she is the bravest of the bantams and Kit is not happy with her and pecked her, it still did not stop Morticia but sent her daughter Violet, (who always hides behind her mothers apron strings) running back to safety. The only bird who did not come in was Hazel.. He was muttering to himself another big hen! I sat with them for a half hour and realized that there was only one bird in the flock who would peck her and it is Rosie (funny thing in the large group of hens in the front Rose was low man on the totem pole) I think things will work out fine and there is plenty of time. Every day I leave the gate open a little more. I expect to see one of Samantha’s eggs in the dog house soon as she has been in and out of it. She loved it there last year. 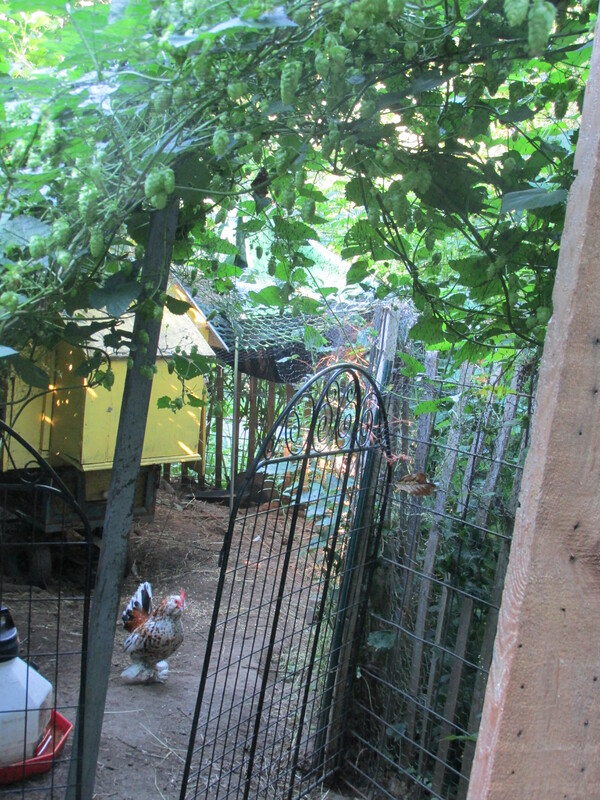 The hops have made an nice archway between the two chicken areas. 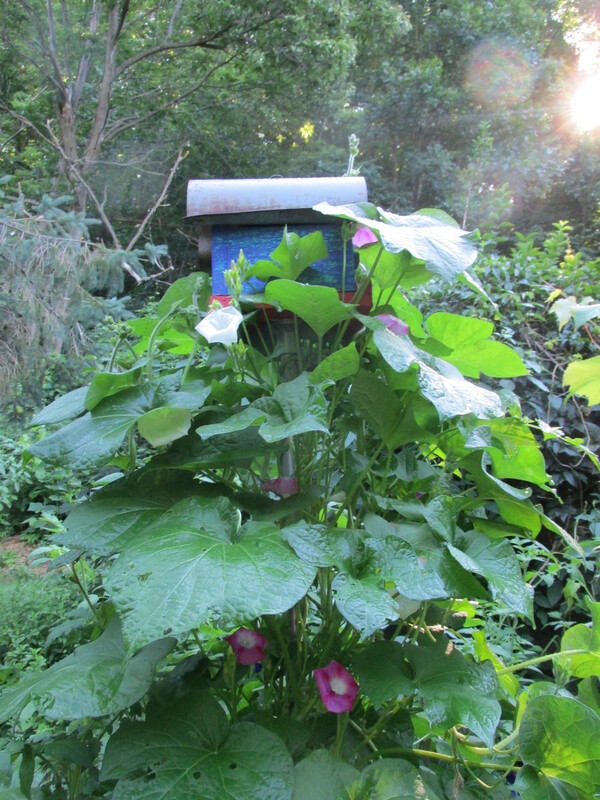 The Morning Glories are so nice this year. Each year I worry that they won’t come back but they do and with more brilliant colors. We had a winter mix overnight. Ice was clinging to the trees earlier in the morning. 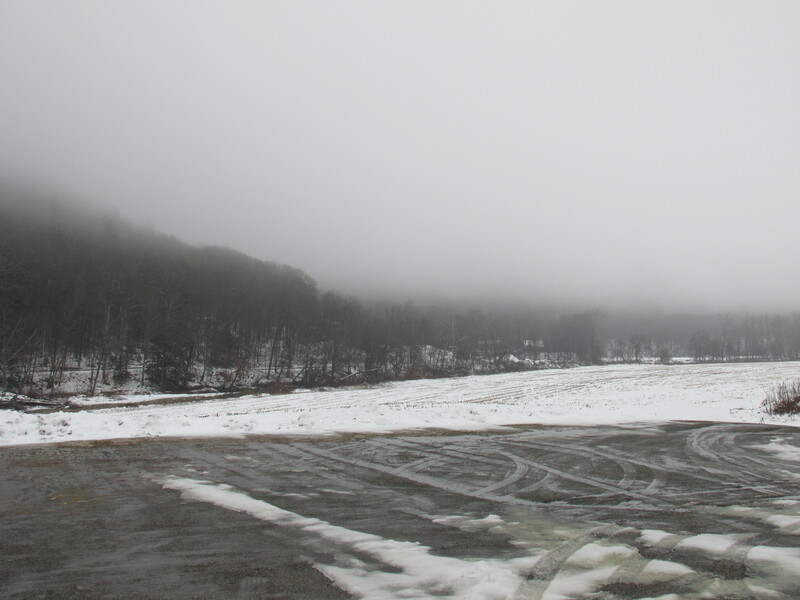 It’s all cleared out now but still foggy. The temps have risen and all is well. 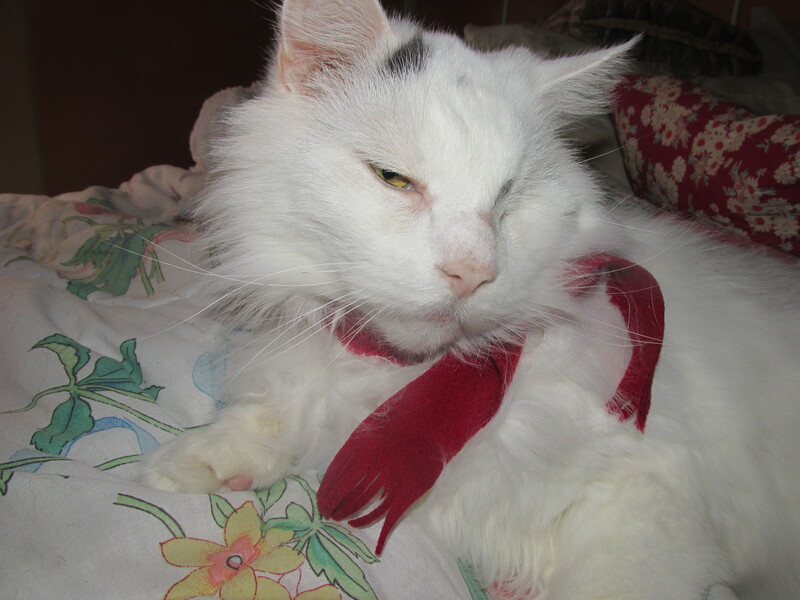 Willie has been under the weather and is going to the vets this afternoon. I got this book on a trip to Florida at a Library book sale. I read it then and am reading it again. I like reading some books for a second or even a third time. I seem to always get more out of the book than when I read it the first time. 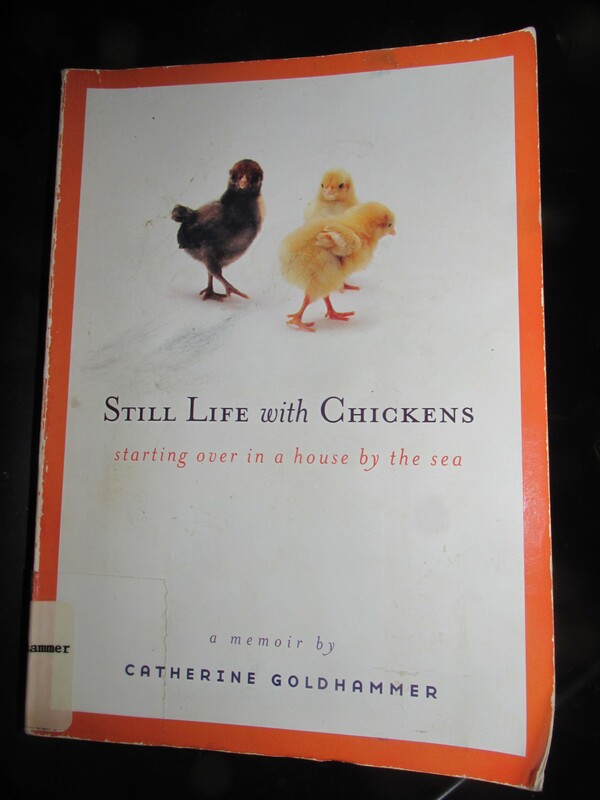 It’s about life changes and raising chickens. I do love this book and highly recommend it. It’s been hard to take pictures of them So now I let them out every day and its easier. They are practicing their flying. They have grown so much but still want their Mama around. I am surprised that she hasn’t gotten sick of them yet. 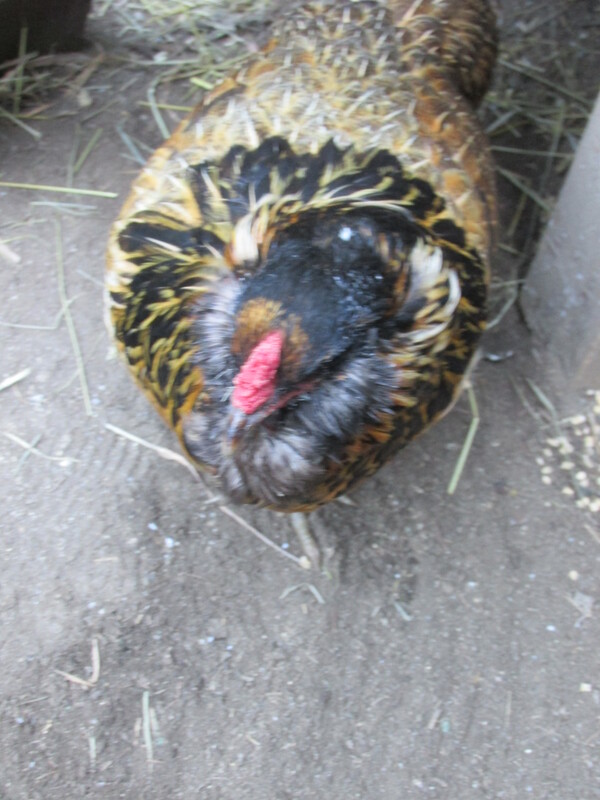 Peeps is a rooster , you can see by his bright red comb and Tweeter is a hen.. They talk talk talk all day. 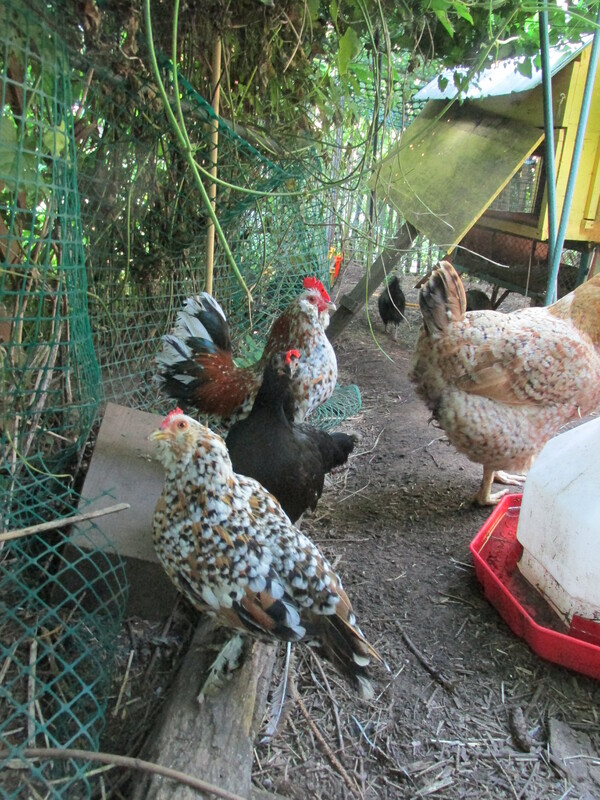 MOre rain is coming, I am feeling well enough to do some necessary things to get the outside chickens in. 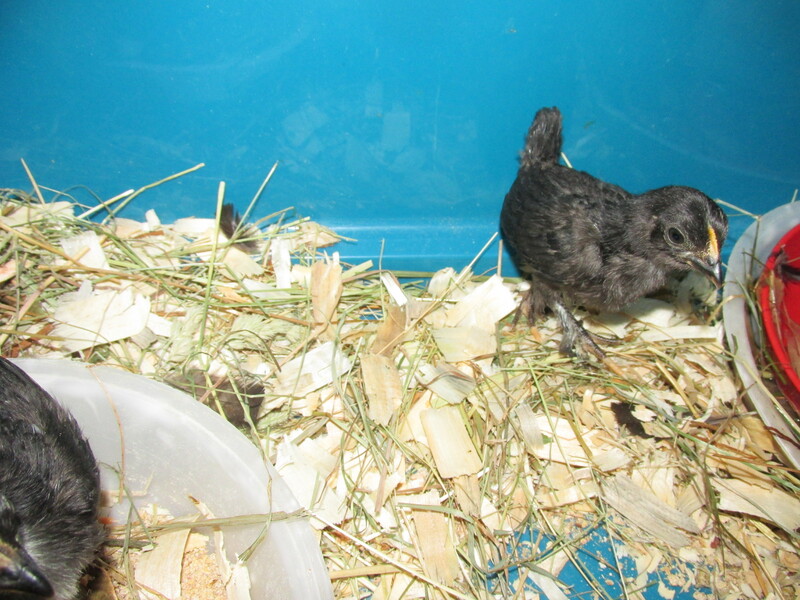 I am hoping to get 3 chickens in today and leave the two new gals out for a while more. There are so many benefits to living in a small town. One is a local newsletter available on the internet which lets you know of the goings on in town. I learned that the town has a grant for a Foot Nurse. SHe is available on Wednesdays and one needs to make an appointment. I went a few weeks ago, and learned for the first time that I had flat feet. No wonder I have been having problems. I picked up the recommended supports and my feet are so much better. She also told me about a product she makes up and recommends for keeping your feet fungus free. One bottle of cheap listerine type mouthwash, a glass jar with a lid on it and some small cotton balls. 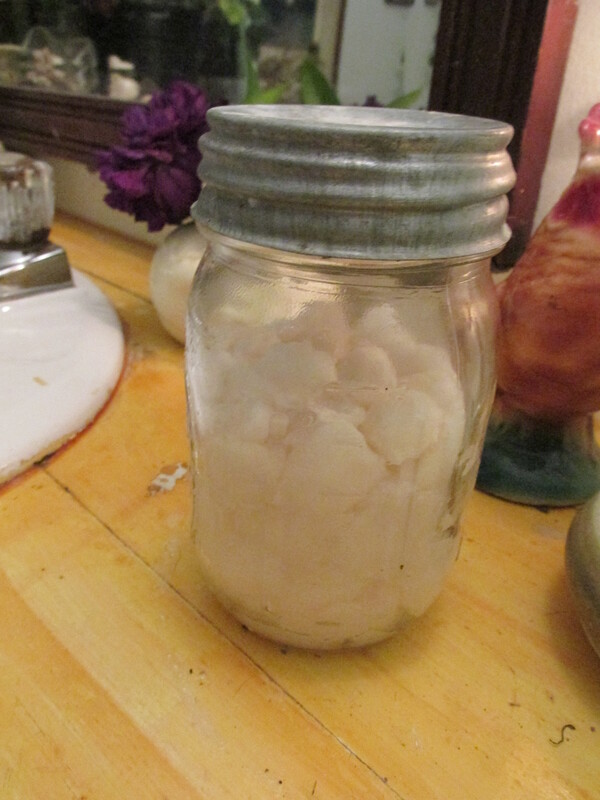 Fill the jar with cotton balls and then add the listerine. Use after baths or showers, just by patting the cotton balls all around your toes. So easy to do with little cost. 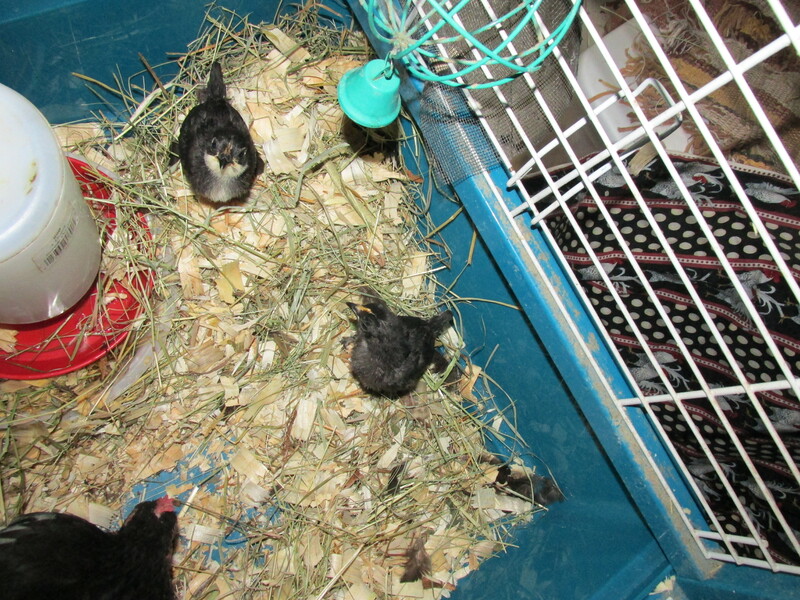 Its wonderful to have them, they are so cute and full of life. The run around constantly and Morticia calls them for new treats. Today they had some clover and the noise from the room! Mama was happy and so were they. I think Peeps might be a Rooster what do you think Anne? There is still time to get into the Primitive SUnflower class at Sheep and Shawl. It will be this Saturday. Also still time for the Hooking with yarn class too. Call Liz to get a place in these classes.